Built upon our philosophy of considered living, AK Threads allines traditional artisanal practices with modern designs to create slow made - mainstay wardrobe pieces. Forming symmetry between lifestyle & design, we remain inspired by concepts of Japanese minimalism and the appreciation of only using what is needed. Denoting respect, intention, simplicity, process and function. Employing minimal colour palettes and bold shapes that encourage both versatility and individual expression, our single garments and collections are designed to form and define the elementary pieces of the wardrobe. Exploring clothing as an art form & part of an everyday ritual- that can adapt with our wearers. Equitably and respectfully, we form our pieces exclusively with selected rural artisans in India, we utilise skills and practices that are intrinsic to local cultures and communities throughout the supply chain, generating employment opportunities and sustaining livelihoods. Connecting ourselves to nature, our fibres are pure plant derived virtually carbon neutral, organic, vegan, nontoxic & biodegradable. We’re committed to using the most sustainable solutions to clothing through materials & design. AK Threads believes in holistic comfort and confidence – for both ends of our supply chain: our makers & you; the women wearing our pieces. Ensuring everyone involved is able to express & shape their everyday practise with bold-ness. Our working partners, our materials and our practices are meticulously researched and selected. Each of our collections is founded on the key elements of sustainable production, recognisable heritage and wide functionality. We develop our products holistically around our artisan’s traditions with the goal of long term, deep partnerships. For every edition, we work in close collaboration with our partners though out our supply chain, to ensure sustainable production, wages, welfare & to build further understanding and connection. We focus on female empowerment and the alleviation of poverty in disadvantaged and isolated communities in rural India; we work with social development organisations that implement female welfare programmes. We understand that it takes human hands and energy to make our garments, and approach our work responsibly; consequently, we only use sustainable production methods and materials, ensuring that our garments have little or no impact on both the environment and the health of the individuals involved in their production. We’ve discovered that through using indigenous techniques – this is the most sustainable option for artisans and our planet. Designs are formed on the basis of minimalism & naturalism with defined lines, elevated sharpness & detailing. The high quality and integrity of the AK label are evident throughout the whole creative process: using natural botanical fibres; employing slow-made production methods; focusing on clothing that displays a modish attention-to-detail yet considers effortlessness and ease paramount. 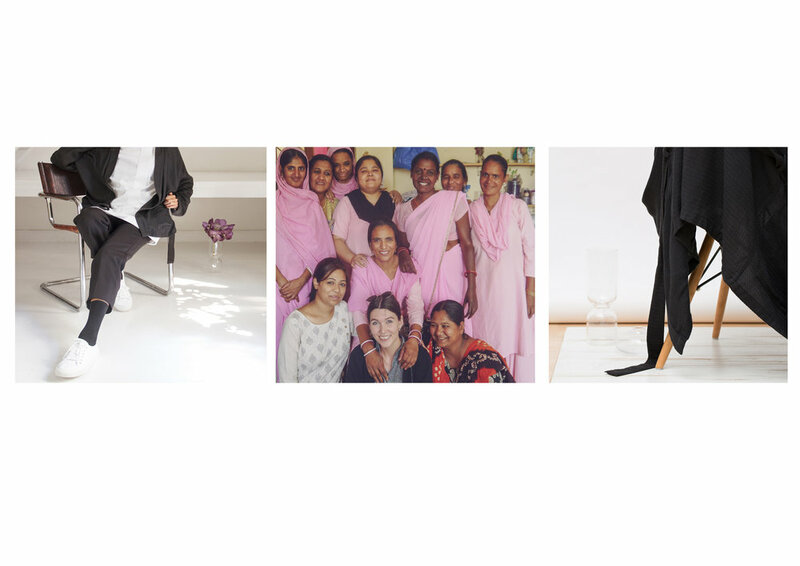 AK Threads recognises the value of soft tailoring and materiality in the clothes they create. Interplay between modest and simple designs, on the one hand, and a playful, poetic edge, on the other, is always visible. Our items are slow-made and designed to be season-less; a limited-edition collection is released twice a year. In this way, we have consciously chosen to focus on lowering consumption, to appreciate and celebrate longevity, and to respect the level of skill and time involved in the production process. Our mission is to found and establish a clothing brand with conspicuous social & ethical impact throughout our supply chains, while making garments with a certain fluidity and allure. We wish to redefine so-called artisanal luxury clothing, aligning innovative design with tradition-based craft and skills, using verifiably sustainable sources, materials and methods at an accessible price point. The brand was established by Gracie Laine Sutton, working in India between July 2015-16 alongside rural artisans and women’s co-operatives. She saw the direct impact that female empowerment, sustainable wages and production had on local communities and opened her eyes to how important clothing manufacture is to job creation. She wanted to provide rural artisans with access to the modern market, utilising skills and practices that are intrinsic to local cultures, whilst producing clothing with endurance, fluidity and allure. With an emphasis on craftsmanship, sustainable production, ecological materials and slow living the brand was born and we haven’t looked back since.